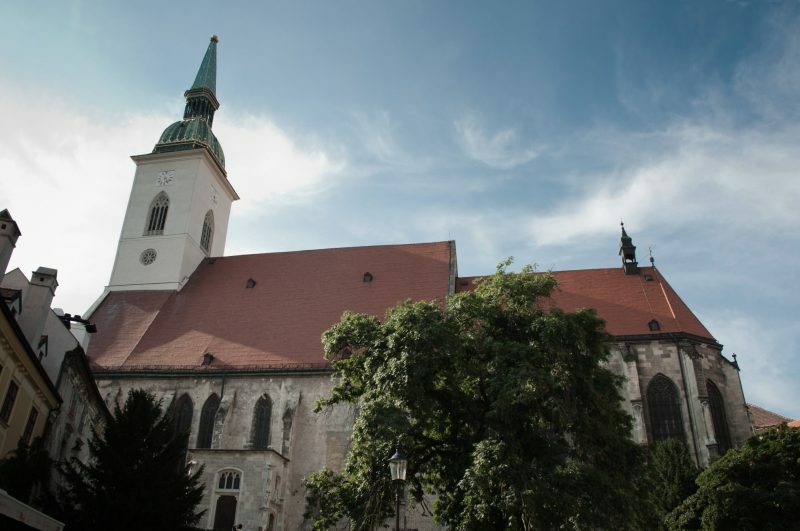 Bratislava’s three-nave Gothic cathedral is built on the site of a previous, Romanesque church, dedicated to the Holy Saviour, from 1221. 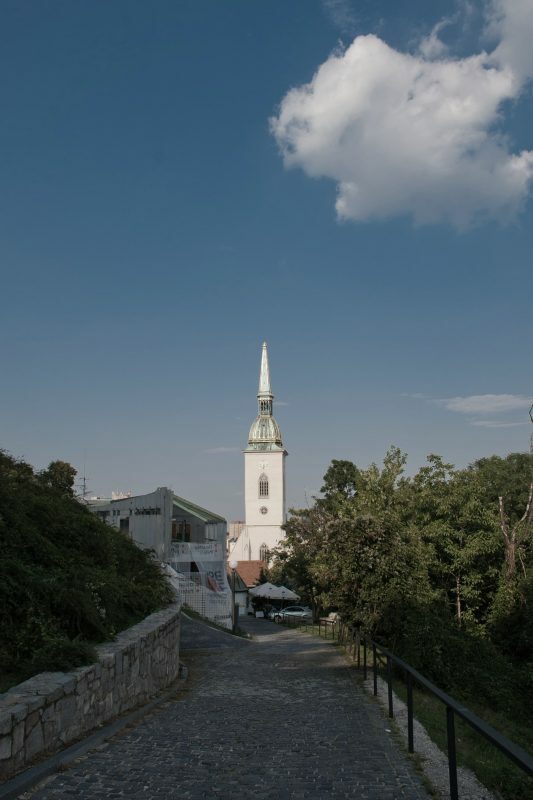 After 1291, when Bratislava was given the privileges of a town, the church was rebuilt to become part of the city walls (its tower served as a defensive bastion). 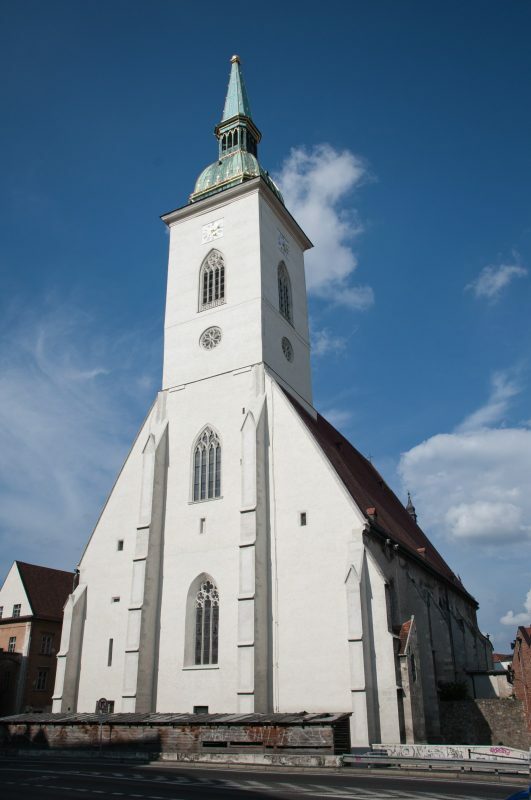 The present church was consecrated in 1452. The interior of the church is large – 69.37 metres long, 22.85 metres wide and 16.02 metres high – and features a grand internal divided portal with a preserved tympanum and a relief of the Holy Trinity. It has four chapels: the canons’ chapel; the Gothic chapel of Sophia of Bavaria, widow of the Czech King Wenceslas IV; the chapel of St Anne; and the baroque chapel of St John the Merciful. The portal of the southern antechamber represents the oldest example of Renaissance architecture in Slovakia. Between 1563 and 1830 St Martin’s served as the coronation church for Hungarian kings and their consorts, marked to this day by a 300-kg gilded replica of the Hungarian royal crown perched on the top of the cathedral’s 85-metre-tall neo-Gothic tower. 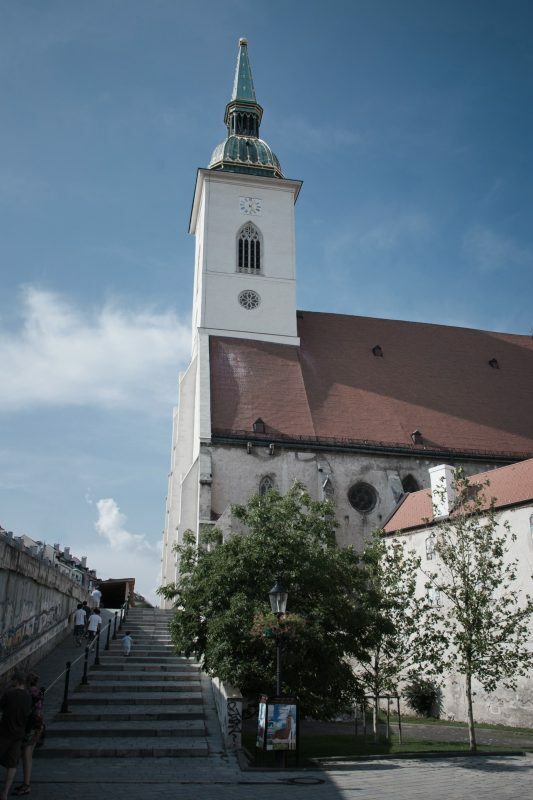 Ten kings, one queen and seven royal wives from the Habsburg Dynasty were crowned in St. Martin’s Cathedral. At the beginning of September each year the pomp and circumstance of the coronation returns to Bratislava in a faithful reconstruction of the ceremony. The first monumental work of central-European sculpture made from lead can be found inside the cathedral. It was created by Georg Raphael Donner for the main altar of St Martin’s in 1734. The group is now in the side nave of the church as a free statue on a pedestal. It depicts St Martin sitting on a horse rampant, bending to a beggar and cutting his overcoat to share it with the poor man.